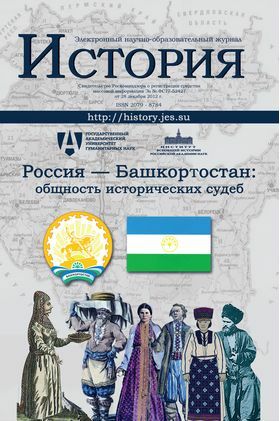 The textbook is a result of accomplishment of the Innovation educational complex “The History of Russia through the History of its Regions” and intended for high school students. History and culture are important factors of socialization; they form ideological culture, ethical guidelines and values, civic education and patriotism. Performing the function of social memory history and culture are also the factors which satisfy social and cultural needs of a person. Studying the history of the region as an integral part of the history of the country will give you, the high school students, the opportunity of realizing yourselves as citizens of this great country — Russia, representatives of ethnic and religious groups, inhabiting Russia and your region, your family, settlement, city, town, district and republic. from what is near to what is far: from the history of your family to the history of your village, settlement, town or city, to the history of your Republic of Bashkortostan, to the history of larger regions (the Volga-Urals), to the history of Russia and the world history. The contents of the textbook cover the period from the ancient times to contemporary history. The materials included in the textbook are organized into sections, chapters and paragraphs according to the conventional division of National History into periods. Each paragraph begins with a key-question which helps to understand the main problem of the paragraph. The text of the author is complemented by fragments from original historical sources and works of prominent scholars included both into the text of the paragraphs and given with tasks after a paragraph. The paragraphs also include various illustrations: portraits, reproductions of famous painters’ pictures, engravings, maps which are an independent source of knowledge. The paragraphs are complemented by various cognitive tasks aimed at search work.